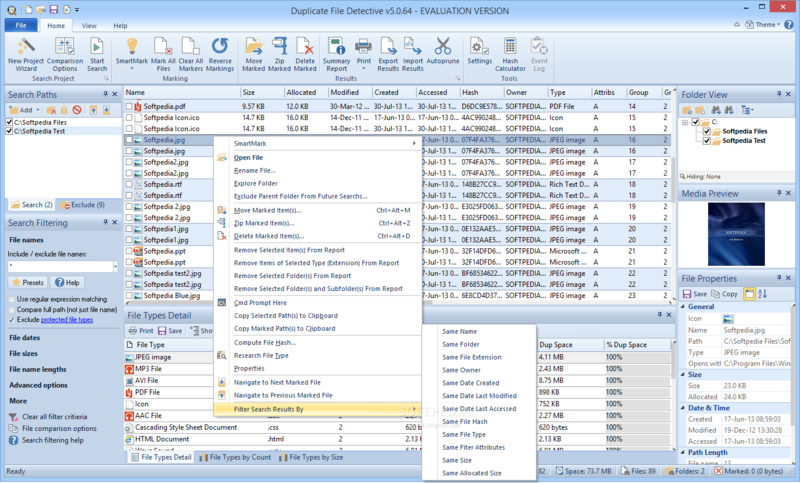 Duplicate File Detective uses state-of-the-art file content analysis technology to show you exactly where the duplicate files are. You can scan multiple file systems - folders, drivers, removable storage devices, even network shares - all in a single pass. Then use the powerful Duplicate Result Manager to move, zip, or delete duplicate files safely, all with assistance from our innovative SmartMark duplicate file selection system. Our fast, network-enabled duplicate file management software saves you time and money, often paying for itself the very first time you use it. Don't spend hours hunting down space-wasting duplicate documents, images, and multimedia files - use Duplicate File Detective, and re-gain control now.